Gus: Our newest student have the luck of the Irish! They were rescued from a hoarding situation and brought to Great Plains SPCA on St. Patrick's Day. With luck like that, we thought they deserved some traditional Irish names. We'd like to introduce you to Aidan and Maeve! Aidan means fiery little one. We thought this made sense with his yellow, orange fur and playful purrsonality. Maeve means the cause of great joy. According to Irish legend Maeve was also a great warrior queen. Someday she will bring great joy as she becomes the queen of her forever home. We will only have Aidan and Maeve for a short amount of time. They are already two pounds and acting like playful, rowdy teenagers. 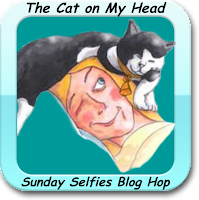 Our new students would love to join the Cat on My Head's Sunday Selfie Blog Hop. Please hop on over to see the other entries. What a couple of cuties. We hope their luck continues and they find great homes. Welcome to Aidan and Maeve. Many purrs to you and them.